With all eyes on the Apple iPhone, Google is about to pull a nice publicity with the launch of a Google Phone from LG. To be available in Europe the Google phone is pretty much an LG Chocolate with Google apps integrated. Google's strong search services are just one click away. 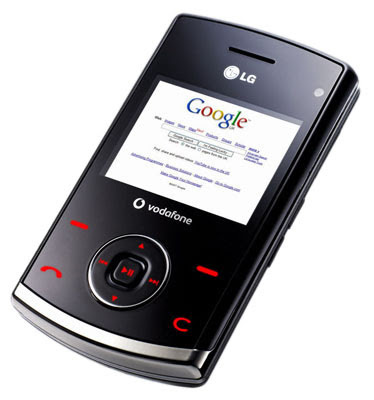 The device sports a red-on-black color scheme not unlike LG's popular Chocolate phone, but it's larger, sporting a 2in widescreen LCD, the better to view Google's web properties, accessed through a fast 3G connection. The KU-580 has an FM radio and an MP3 player - controlled with dedicated playback keys - along with Bluetooth stereo and 3D sound enhancement. LG even said it has a song-writing app for budding musos. There's a two-megapixel camera on the back and a smaller snapper on the front for video calls.